Robin Buckley is working on her Master's project at the University of Western Ontario under the supervision of Dr. Guy Plint. She grew up in Quispamsis, New Brunswick and received her undergraduate education at Dalhousie University in Halifax. Her honours project, supervised by Dr. Marcos Zentilli, focused on using the (U-Th-Sm)/He apatite method to assess the thermal effect of salt structures on the cooling ages of rocks located in the Sverdrup Basin on Axel Heiberg Island in Nunavut. 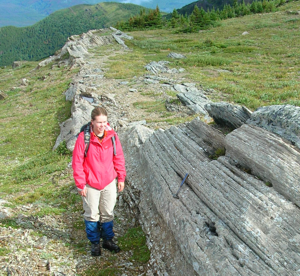 She worked on an exploration project for Husky Energy during the summer of 2008 which helped to further her interest in the fields of sedimentology and stratigraphy. After completing her honours degree in 2009 she attended the Prospector and Developers Association of Canada's Student-Industry Mineral Exploration Workshop and did some traveling before beginning field work for her Master's project in northeastern British Columbia. Her interests include outdoor activities especially hiking, skiing and swimming. The aim of the project is to study Boulder Creek Formation rocks in outcrop in the B.C. foothills, from the vicinity of Mount Reesor northward to the Peace River valley. Outcrop sections will be correlated to nearby well logs and through a regional grid of well logs to encompass the depositional area of the Boulder Creek and Paddy formations. The results of this study are expected to provide an improved regional stratigraphic and paleogeographic framework for known hydrocarbon-bearing reservoir units. The study will address two immediate questions. 1) What is the ‘Paddy Barrier’? Does it consist of a single sandbody, or is it an amalgam of stacked shallow marine sandbodies? 2) As work by others indicates that the Paddy / Walton Creek facies may disappear abruptly northward, what is the mechanism for this disappearance?